For over ten years, E&E Construction has been providing local clients with all types of commercial roofing services. Our track record speaks for itself, which is why we can call ourselves a member of the Choice Roofing Contractor Group. 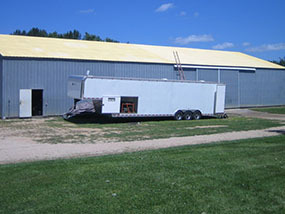 We offer a variety of services and work on all types of commercial roofs. Clients in Springfield, Ohio can call us today at (740) 331-0695 for a free onsite roof evaluation. At E&E, we believe that business owners should have their commercial roofs inspected twice per year. This can save you tons of time, stress, and money in the long run. The truth is, most leaks and roof issues are easily fixable when they are caught early on. However, if these minor problems go unnoticed the leaking water can turn what was once a small repair into a full roof replacement. Never mind the amount you’ll spend on restoring the interior of your building. Yes, a commercial roof can easily last over 40 years — so long as you maintain it. At E&E, we offer roof inspections, repairs, maintenance, and restoration services to keep your roof in tip-top shape. Ask about our customizable roof maintenance programs to find out how we can extend the lifespan of your roof and save you both time and money. E&E Construction are experts at repairing all types of commercial roofs. Whether your roofing system is metal, asphalt, PVC, rubber, etc., our team of roofing technicians won’t leave the job site until your roof is performing as good as new. Aside from general roof repairs, E&E also offers emergency roof repairs and leak detection. E&E Construction also performs full roof replacements, roof coatings, roof restoration, and more. 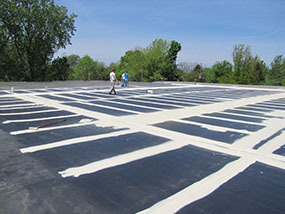 We specialize in installing roofing systems that make your building more energy-efficient. If your roof is in too bad of shape to repair, we can replace it or restore it back to new. As you can see, E&E Construction has all the answers when it comes to commercial roofs. Our variety of commercial roofing services means that clients in Springfield, Ohio won’t need to reach out to other companies for any of their commercial roofing needs. Call us today at (740) 331-0695 for a free onsite roof evaluation!